Steve Ballmer, along with the help of Ryan Seacrest and a few colleagues, spearheaded Microsoft's last CES appearance today, recapping the company's just announced product reach – HTC Titan II, Lumia 900 – while looking at what the future holds for the Redmond-based company: Metro, Metro, Metro and Windows, Windows, Windows, Ballmer emphatically shouted. The show put big emphasis on the Metro experience and how it translates to every aspect or Microsoft's current Windows lineup, from phones to tablets to computers and even to Xbox. The company ran through a number of demonstrations and recaps, kicking things off with Derek Snyder, Windows Phone product manager. Snyder emphasized how Microsoft is really working to put people first with its mobile OS – not specs or clunky, difficult interfaces – through tiles, social networks and how users communicate through SMS and regular old phone and video calls. Snyder said its how the live tiles put things users care about most right at their fingertips, including much of what we've seen already in features like people hub. Transitioning from there, the keynote moved towards the PC market. "Two things that are constant in this industry is that things change, and people don't want to compromise," Ballmer said. "No one wanted to give up anything they had on their desktop when they moved to notebooks. We don't give up anything as we keep moving down that path. With Windows 8, we've rethought everything, from chips to the interface." Microsoft really wanted to stress that the experience across all lineups will be integrated. Next in the speaker lineup was Tami Reller, chief marketing officer of Windows, to talk about and demonstrate Windows 8. "The Windows start screen is fluid, dynamic, immersive. It's designed to work with touch or a mouse and keyboard. No matter how large or small your screen is, you have what you need. Windows 8 is designed to bring consumers a no compromise experience." The biggest news from Reller was that Windows 8 will run on both x86 and ARM – Reller demonstrated the experience on prototype tablet hardware with Tegra 3 guts. Applications in Windows 8 run in full-screen, bringing the app's full attention to the user, Reller said. Want to share something from the news reader? Share it without ever leaving the app with the people you care about most. You can even snap multiple apps on one page – the apps are smart enough to snap themselves in spaces that are most intuitive for the user. Oh, and every single Windows 7 computer in the world is upgradable to Windows 8, with another developer build pegged for late February as the next step toward the OS's impending release. Next up, and probably the most impressive and promising aspect of Microsoft's keynote, was Xbox, Kinect and Windows integration – Kinect is hitting Windows February 1, Ballmer said, a release that has been a long time coming. The familiar voice and motion control was there using Bing, but Microsoft is now creating interactive television content in partnership with dozens of providers. The company showed off what they called two-way TV where a mother-daughter type pairing interacted with an episode of Sesame Street. When prompted by Grover, the pair tossed coconuts into the character's cardboard box through natural throwing motions – it was interactive, educational and looks like loads of fun for the little ones. Overall, Microsoft rehashed a lot of what we've already seen: Windows Phone, Windows 8 and Kinect with voice and motion control. Still, the demonstrations further solidified strides the company has made in the past year to make it a viable competitor in the mobile space, while also cementing its place in the PC world. The company clearly has an eye on creating immersive and user-oriented experiences with its evolving lineup. To ends things off, Microsoft dodged what may have been an obvious Xbox 720 question. "What's next?" Seacrest asked. Windows 8 is what's next, Ballmer responded. 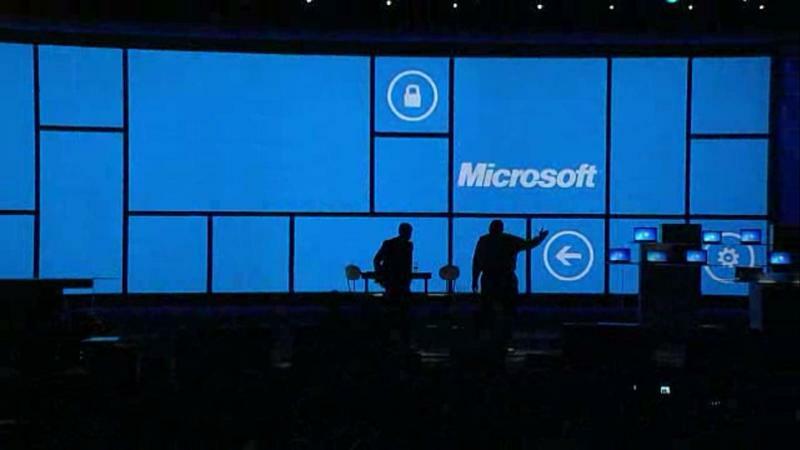 Judging from the demonstrations on-hand at Microsoft's keynote tonight, that's definitely not a bad thing.